The best kind of self-rescue after a capsize is to roll back up again, but it is always possible to end up in the water alongside your kayak and with no immediate prospect of rescue by a friend. Self-rescue skills are worth practicing, often and in real conditions. It's best to have a competent kayaker standing by in case you have unexpected difficulty, but it's possible to practice solo either on enclosed water or where the direction of both wind and current means that you and any stray equipment will be carried to safety. Elsewhere we recommend wearing kayak clothing which will let you function properly despite being in cool water for 15 minutes. The main thing is to get back into your kayak in the shortest possible time. Only a few minutes of immersion in cold water may leave your hands too cold to open flares, untie knots or re-fit a sprayskirt. See Cold Shock, Swim Failure & Hypothermia. We also recommend that any kayak have full flotation in the form of bulkheads, inflated buoyancy bags or both. If you come out of your kayak, water should enter only the cockpit area. The buoyancy of the ends means that the kayak will float high, with the cockpit no more than half full. If you have a central pillar of closed-cell foam in the cockpit it will reduce the amount of water that can enter and makes a flooded kayak much more stable by reducing the "free water effect". It means you can carry on if your cockpit floods because of a hole in the hull or because your sprayskirt comes off but it doesn't make self-rescue with a paddle float any easier. Ordinary sit-on-top kayaks are slow but very stable. After a capsize the user just turns the boat the right way up, gets his or her upper body onto it, swings one leg up until (s)he is straddling it and then sits up and moves into the seat area. My own favourite kayak's lean and mean, with a very small cockpit, so the image below is about the best I can do the right way up. Still, there's always the re-entry and roll technique below. If you've got a skinny kayak but a big cockpit, you can practice this technique: Flip the kayak the right way up, using the technique in 2 below to get as much water out as possible. Get astride the rear deck holding the paddle in both hands; sit up and start a sculling brace; scootch forward until your bottom is above the seat; sit down on the seat leaving your legs outside, and then bring one leg in at a time. 1. You don't want to get separated from your kayak while you are attaching the float to the paddle. If you once lose physical contact with your kayak, in even a light wind it will immediately blow away and your PFD will prevent you swimming fast enough to catch it up. A good way to hold on but have both hands free is to keep one leg up inside the cockpit. 3. Place the paddle across the kayak at the rear of the cockpit and either hold it firmly in position or attach it to the kayak. 4. Keeping your weight as low as possible at all times, get your upper body flat on the rear deck, face down, knees near the cockpit. How to get into that position? Many find the easiest way is to start off in the water alongside your cockpit with your left hand on the paddle and your right hand on the boat, and just surge up out of the water. Others prefer to start off in the water alongside the rear deck, with their right hand on the paddle shaft and left hand on the kayak; having got the weight of their upper body on the rear deck, they bring one foot up behind them and hook it over the paddle shaft out near the float, then bring up their other leg. The best solution for you depends on your weight, flexibility, and how high your kayak floats in the water. 5. Having got into that position, stay face down, keep holding the paddle shaft firmly against the back of the cockpit, and get your right lower leg into the cockpit. Then put the other leg into the cockpit. Quickly twist round until you are sitting on the seat. 6. Bring the paddle in front of you. With the paddle float on the surface and the shaft across your lap, you can still lean on it for support. Get your sprayskirt half on, tip out as much water as you can, pump out the rest and carry on. 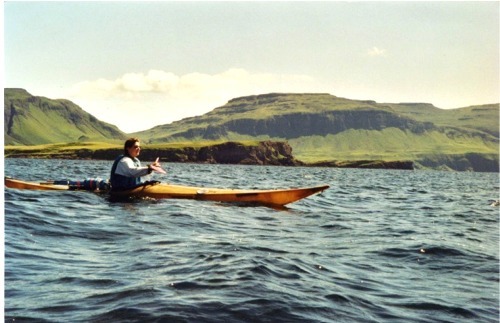 If the sea is anything other than calm, or you have a small cockpit or a central foam pillar you may need to put the float on your spare paddle and attach the paddle to your kayak to make a rigid rescue outrigger. Some deck rigging will hold a paddle in the right place, for example this neat solution from Kajak Sport. It's just two short lengths of nylon webbing, each with Velcro sewn on so they simply wrap round a paddle shaft. Reinforce the deck if necessary and use four small bolts to attach one to each to each side of the kayak's rear deck. If your deck rigging is no help you can attach the paddle with a rescue stirrup. If you don't have a stirrup you can loop some cord round one end of the paddle, under the hull, up round the paddle shaft and tie it off with a quick-release knot. The bad news about attaching your spare paddle as a rigid rescue outrigger is that you've got to detach it when you're back in the kayak, and that probably means doing a sculling brace with one hand. The good news is that before you do, the outrigger will make it easy to empty the cockpit with a portable pump and re-fit your sprayskirt. For much more detail, see the manual on paddle float rescue on the Mariner Kayaks website. Although retired, Matt Broze keeps this website online for its technical content on many sea-kayak topics, not least the outrigger paddle float rescue which he tells us was his baby as long ago as 1980. A paddle float self-rescue is unlikely to work in a rough sea. With practice you can slide your legs back into your capsized kayak, brace yourself into the seat with your knees, and roll back up again. The re-entry and roll is not too difficult in a swimming pool. You may be able to do it with the kayak upside down, re-fit your sprayskirt and roll up with hardly any water inside the kayak. At sea, wearing full kayaking clothing and a PFD, you will probably need to put the kayak on its side, get your legs back in and brace your knees under the deck. While you're doing this the kayak will probably go fully inverted. You then roll the kayak back upright. This will demand a lot more guts and technical ability than simply acquiring a reliable roll in the first place, but it can be done. You may find it easier if you attach a paddle float to your paddle before rolling back up. With your cockpit flooded, you won't find it easy to stay upright unless you have a central pillar of closed-cell foam in the cockpit, or a foot pump you can use while you do a sculling brace.